A curious story emerged at the Washington-based Al Monitor media site at the end of October alleging that Russia secretly sent a handful of high-level envoys to Syria in a failed bid to convince Damascus to replicate the federal-autonomy model that Moscow practices. The article goes on to say that these dignitaries suggested that this was the most optimal way for dealing with the Kurds’ illegal “federalization” (internal partition) declaration from earlier this year, pointing to Russia’s own success in employing its domestic model to effectively handle dozens of national autonomy movements within its broad borders. If the story is to be believed, then Syria politely rejected the recommendation and that was the end of it, but whether or not the anecdote related in the article ever truly happened or not, it had the effect of starting a conversation about the applicability of Syria ever emulating Russia’s federal-autonomy model. The argument in favor of this is clear enough – Syria will sooner or later have to reassert sovereignty over the PYD/YPG-occupied northern portion of the country which illegally declared “federalization” around the beginning of the year, and it would be ideal for all parties if the reintegration occurred peacefully and didn’t spark a civil war between Syria’s Arab and Kurdish citizens. Advocates of the “federalization” model say that this could most easily be accomplished if Damascus just gave in to all of the Kurds’ demands and accepted the establishment of a de-facto independent ‘buffer state’ along most of the Turkish border. Rebuffing critics who warn that the creation of a pro-Western statelet carved out of another country’s territory would essentially amount to a “second geopolitical ‘Israel’” in the heart of the Mideast, they say that such fears are an over-exaggeration and point to Russia’s federal model as an example of a workable construct which has avoided these foreign-concocted pitfalls. Unfortunately, the individuals promoting the transplantation of Russia’s federal-autonomy system onto the Syrian Arab Republic are either uninformed about the history and circumstantial idiosyncrasies about why Moscow even has this system in the first place, or are deliberately trying to make a misleading appeal to genuine patriots and multipolar supporters in order to trick them into committing the suicide of their sovereign state. Russia’s federal-autonomy framework is a legacy of the Soviet past when the communist authorities took measures to help the non-Russian ethnic groups establish a sense of national identity which could then move them further along the theoretical unidirectional path towards socialism. In over a dozen instances, certain ethnicities were even given their own union-level republic on par with the Russian one, which ended up forming the foundation for their independence after the Soviet Union’s 1991 dissolution. The granting of federal-autonomy to some of them, however, was also part of a wider strategy of ethno-ideological expansionism, whereby Moscow tried to ideologically cultivate the members of a geopolitically divided demographic with the expectation that it will make it easier for the Soviet Union to one day integrate their cross-border brethren into the communist system. For example, it can be posited that one of the reasons in giving the Belarussians and Ukrainians their own union-level republics was to facilitate the Soviet Union’s future westward expansion into what was at that time the majority Belarussian- and Ukrainian-populated eastern “Kresy” (borderlands) of the Second Polish Republic (acquired after the Polish-Soviet War and historically part of ancient Kievan Rus). Correspondingly, giving the same status to the Moldavians was intended to pursue an identical goal vis-à-vis their culturally similar Romanian neighbors, just as doing so with the Azeris was supposed to accomplish this in northwestern Persia/Iran and was even attempted right after World War II with the brief “Azerbaijan People’s Government” there. Another example of this was when Moscow decreed the creation of the Karelo-Finnish Soviet Socialist Republic in 1940 after the Winter War, obviously with the intent of one day using it as a springboard for absorbing Finland proper. This project was abandoned after World War II, and the newly commissioned union-level republic was downgraded in 1956 to become the Republic of Karelia within the Russian Soviet Federative Socialist Republic (which would become the independent Russian Federation after 1991). The reason why the Soviet Union and later the Russian Federation were able to so adroitly multimanage a multitude of union-level and sub-union federal-autonomies is because of the historically strong nature of the centralized state and the unique historical conditions which made the country a multiethnic civilization for nearly the past half a millennium. Even at its weakest point after the Soviet dissolution in 1991, Moscow was still able to protect its domestic political sovereignty because it wasn’t completely ravaged by the type of war that Syria has experienced over almost the past six years already. This brings the conversation around to discussing Syria’s unique situation and how it structurally differs from the Russian one to such an extent that it would be irresponsible for Damascus to blindly copy Moscow’s model. The Syrian Arab Republic is the modern-day successor state of all of the grand civilizations that at one time or another emerged from this territory across the past several thousand years. It’s very difficult to compare a multi-millennial civilization such as Syria’s with one that is only a little over one millennium old like Russia’s, but this becomes relatively easier when analyzing the state of each country in the early modern and modern eras. From around 1500 onwards to the beginning of the 20th century, Russia grew at an exponential rate as it expanded to become a geographically large and extraordinarily diverse empire, while at the same time Syria suffered under occupation by the Ottoman Turks and was partitioned into several “sanjaks”, or provinces. Despite the forced administrative separation that was imposed on it during the lengthy occupation, many Syrians still retained their unique sense of cosmopolitan civilizational identity which would flourish after independence. Syria’s pre-Ottoman and antiquity borders would never be restored owing to the Western Betrayal that the Arabs suffered after the end of World War I when the British and French collaborated with one another to walk back their previous commitment to what would have otherwise been the Arab Kingdom of Syria and instead further partition the ancient Syrian lands between themselves. The colonial borders that resulted from this historic backstabbing would form the Sykes-Picot order that continues to fragilely prevail into the present day, though it’s at serious risk of being revised due to the looming post-Daesh political fragmentation of Iraq and the ongoing plot to “federalize” (internally partition) Syria. In and of itself, there’s nothing innately destabilizing or dangerous about political federalization, as can be seen by the American, German, and Argentinian cases, for example, but it’s just that problems almost inevitably arise whenever the mutated variation of Identity Federalism is introduced. The author wrote a comprehensive research paper about this new political trend for Russia’s National Institute For Research Of Global Security titled “Identity Federalism: From “E Pluribus Unum” To “E Unum Pluribus””, and the reader should go through it if they’re interested in more of the high-level political-theoretical details and nuances that the geostrategic weaponization of this governing structure entails. In a nutshell, the study proves that the implementation of federal models based on identity differences (whether ethnicity, religion, etc.) essentially amounts to the internal partitioning of the said state and creates a structural pretext for the affected “federal” entities to take their de-facto independence to the next legal and internationally recognized level one day. This directly affects Syria because of the presence of the Kurdish minority in the northern regions, many of whom came to this region after World War I and following the commencement of Turkey’s anti-PKK campaign in the 1980s but refused to accept Syrian citizenship. Although recognized as inhabitants of Syria and for the most part treated as legal citizens, some of them declined formally becoming “Syrian” because they insisted that they’re “Kurdish” and will one day have their own independent country to live in, whether on the Syrian lands that they claim as their own or elsewhere in the abutting “Kurdistan” regions of the Mideast. Under the present circumstances of large-scale geopolitical upheaval sparked by the “Arab Spring” theater-wide Color Revolutions and the subsequent American-abetted rise of Daesh, the granting of federalism-autonomy to the Kurds in northern Syria would embolden them to accelerate their geopolitical separation from Damascus and continue working on their eventual US- and ‘Israeli’-backed “independence”. Instead of strengthening Syria like it does to Russia, federalization-autonomy would actually weaken the state and set it on the path of eventual dissolution. The only uncertainty would then be whether this process would play out peacefully with Damascus acquiescing to the country’s inevitable collapse just like Moscow did in 1991, or if it would end in civil warfare and even more large-scale violence just like what happened to Yugoslavia after its peripheral federal constituents tried to forcefully break away from Belgrade. If Syria were ever to make the ill-fated decision to accept federalization-autonomy, it would result in nothing less than the “Lebanese Bosnification” of Syria, or in other words, the adaptation of Lebanon’s “confessionalist” policy of sectarianism along legally delineated internal borders such as is seen in Bosnia between the Federation and Republika Srpska. This is doubly dangerous for Syria because the country would not be able to remain unified if the foreign-manufactured sectarian differences that presently abound within it are formalized into strict territorial divisions. The entire territory of the Syrian Arab Republic (if it even retains its constitutional name by that point, which is doubtful) would suddenly transform into a geopolitical time bomb against all of its neighbors if it devolves into a motley mess of ethno-sectarian territorially defined administrative identities, each of which would be automatically predisposed to falling under the influence of one or several different foreign patrons as they all compete with one another across the “federalized” checkerboard, thus further increasing the prospects that they’ll spark a civil war as part of their proxy power struggle. The richness of Syria’s natural ethno-diversity derives from the fact that all groups had hitherto been assimilated and integrated into society prior to the Hybrid War that was viciously unleashed against the country, and that this was so successful that it would have been (and still is, to an extent) impossible to geographically separate the different identities from one another. Arabs, Kurds, and Armenians, to name but a few, lived together in harmony and inhabited the same neighborhoods, mirroring in many ways the eclectic state of affairs in pre-war Bosnia or parts of present-day Lebanon. Nevertheless, the War on Syria had the effect of prompting migrations (both forced and voluntary) within and outside of the country, which contributed to the illusion that certain people now inhabit clearly defined sections of Syria. Even if there is some superficial truth to this upon first glance, it doesn’t reveal the deeper story because it’s impossible to convey the extent of just how closely intermixed each of these “separate” populations truly are within the country’s main cities. The only way to functionally administer an “Identity Federalized” (internally partitioned) Syria would be to commence large-scale population transfers (whether voluntary, pressured, and/or forced) akin to the chaotic post-World War I situation between Greece and Turkey, and the traumatic post-World War II experience with the Germans, Poles, and other peoples of Central and Eastern Europe. Syria has already suffered the worst humanitarian crisis since the Second World War, so its people are in no position to undergo even more hardship through the aforementioned “demographic reshuffling” that would have to occur in order to make the “federalization” (internal partitioning) ‘viable’ for the short-term, and it’s all but assured that this process will serve as a catalyst for an actual civil war that resembles the ones that earlier broke out in both Lebanon and Bosnia. Copying the Russian model onto Syria is bound to end in disaster. Syria hasn’t experienced the same historical circumstances or shares any natural internal ethno-territorial similarities to make Moscow’s federal-autonomy system work within its borders. The “identity differences” that have lately become fashionable for foreign observers to discuss between the Sunnis, Shias, Alawites, Kurds, Druze, and others in Syria were inorganically aggravated due to the Hybrid War, which splintered the once-unified Syrian identity into a kaleidoscope of categories. Many Syrians still retain a patriotic attachment to their cosmopolitan homeland and the shared civilization that has bound them together for millennia, but it would be irresponsible to overlook just how powerful of a force ethno-sectarianism has been throughout the course of the War on Syria, since there is also a sizeable proportion of citizens who identify themselves based on this divisive personal criteria over the inclusive one of their Syrian nationality. 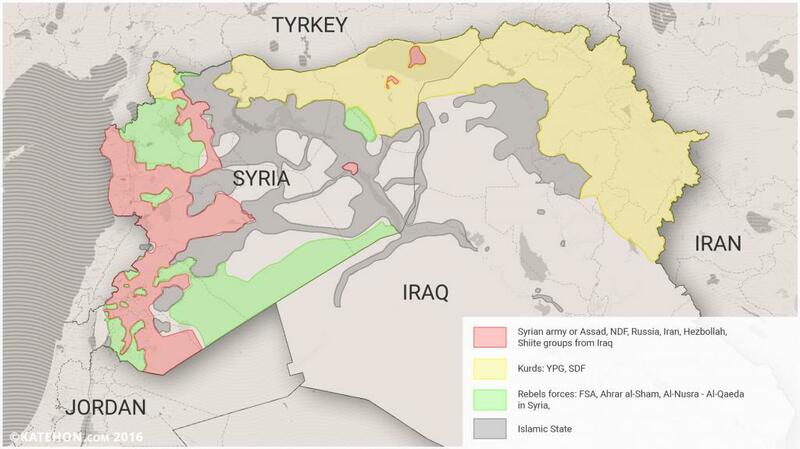 The two groups of Syrian citizens most susceptible to this ideological virus of identity separateness are the Kurds and to a lesser extent the Sunnis, and they stand to inflict immeasurable geopolitical damage if granted their own “federalized” (internally partitioned) statelets. It must be said that not every Kurd or Sunni obsesses over their own identity and seeks to provoke conflict with their fellow Syrian neighbors, but just that these two groups have been the target of a very intense and prolonged information-psychological warfare campaign that has achieved moderate success in convincing some of them that they are not Syrians but are Kurds or Sunnis. The foreign powers which have conspired against Syria for over the past half-decade have a stake in seeing this happen because they plan to exploit these groups for self-interested geopolitical purposes according to the preplanned “federalization” (internal partition) model which they hope to impose on all of Syria. In the regrettable event that Syria is sliced up into several ethno-sectarian “federalized” statelets, it’s conceivable that the Kurds would acquire their own in the PYD-YPG-occupied lands of northern Syria while the Sunnis would probably receive a large swath of central and eastern Syria all to their own (overlapping with the territories previously occupied by Daesh). The emergence of a sub-state “Kurdistan” and “Sunnistan” would probably happen concurrently with a similar process of state fragmentation in Iraq, thus leading to the creation of two transnational sub-state entities straddling the formal Syrian-Iraqi border. “Kurdistan” would turn into a terrorist safe haven for the anti-Turkish PKK and the anti-Iranian Kurdish Democratic Party of Iran (KDPI), both of which will use this new de-facto state to organize and carry out cross-border attacks against Ankara and Tehran, which is actually already happening right now but will only intensify the more “independent” “Kurdistan” becomes in geopolitical practice. This is bound to result in retaliatory strikes from these two larger and much stronger states and could even instigate a larger regional war after the defeat of Daesh. As for “Sunnistan”, it’s envisioned that this sparsely populated but strategically positioned space could become a critical American-Saudi outpost in the dead center of the Mideast. Moreover, combined with the ‘Israeli’ influence that’s expected to pervade across “Kurdistan”, these two transnational sub-state entities will form a powerful unipolar force in keeping Syria and Iraq separated from one another and linking together Saudi Arabia with Turkey, thereby facilitating the possible construction of a Qatari gas pipeline from the Persian Gulf to the EU one day. Both Damascus and Baghdad will be powerless to stop this if they agree to “federalization” since these national centers will have ceded a considerable amount of their sovereignty to those statelets by that point, and it’s unlikely that either of them will risk going to war against “Kurdistan” and “Sunnistan’s” foreign patrons if they change their minds and decide to initiate a unification campaign. More than likely, they’ll instead resign themselves to accepting their fragmented fate if they had already fallen for “federalization” in the first place, since it’s comparatively easier to retain a unitary state than it is to reverse the devolution process and reintegrate an ethno-territorial unit that had already experienced de-facto “independence”. Damascus is not in a position to influence Baghdad and the somewhat different situation going on in Iraq, but what Syrian officials can do is make sure that their country does not allow any “federalization”/”autonomy” (internal partition) proposals to be written into their new constitution once the document is revised in accordance with UNSC 2254 before next summer. Regardless if Iraq ends up forever fragmented or even legally ceases to exist as a state, Syria can still protect itself from the fallout so long as it hasn’t structurally weakened itself and its statehood by naively “federalizing” (internally partitioning) itself as a foreign-proposed “solution” to its externally provoked domestic ailments. With the War on Daesh almost completed, it’s time for Syria to contemplate what its post-conflict internal political composition will look like, especially given the pressures being put on it by UNSC 2254 to revise its constitution before the upcoming summer. More than anything, Syria must avoid any “federalization”/”autonomy” (internal partition) clauses at all costs in order to not experience the “Lebanese Bosnification” of the country, no matter if this false “solution” is misleadingly marketed as “following the Russian model”. Those who advocate such the latter approach likely have good intentions, but it’s bound to lead to terrible results. Just because there’s observably a “pro-Kurdish” faction in Russia’s Ministry of Foreign Affairs doesn’t mean that the entire Kremlin is in favor of seeing Damascus grant this group “federalization”/”autonomy” as its own de-facto independent statelet, as differences in policy are as common among Moscow’s decision makers and strategists as they are among Washington’s, Beijing’s, Brussels’, and other leading actors’. What Syria has to do in the face of the Kurdish challenge is firmly maintain its unflinching stand against devolution and stoutly defend the unitary status that it needs in order to ensure its survival as a sovereign state. Having said that, the Syrian system could benefit from adapting more flexibility in addressing the legitimate and patriotic needs, grievances, and requests of its citizenry, as it’s a given supposition that the country will never return back to its old way of doing things ever again after this conflict has finally ended. This can be most stably achieved through political plurality and continuing with President Assad’s decision to gradual transition the country from being a de-facto one-party state to a multiparty democracy, though following the National Democracy model in accordance with Syria’s civilization, history, culture, and unique circumstances. Copying and pasting the Western “liberal democratic” system onto Syria would instantly disrupt its entire civilizational fabric and lead to its inevitable dissolution just as rapidly and violently as if the country “federalized”, which is why the National Democracy framework is the only way forward. This format can develop to be flexible enough to respond to grassroots stimuli, yet resistant enough to deflect foreign territorial plots by relying on the educated, experienced, and patriotic citizenry to make the final judgement about what would be best for Syria’s interests. Even with this ideal system, however, certain structural safeguards need to be in place in order to prevent it from being exploited for ulterior motives, whether they originate with foreign conspirators and/or internal demagogues. Any movement that dangerously deals with destabilizing Syria’s internal situation or that of its neighbors must be either reformed or strictly curtailed, meaning that the Kurdish PYD and the Syria Social Nationalist Party (SSNP) must be intensely scrutinized during this time. As for the former, their 2015 “federalization” (internal partition) manifesto was analyzed by the author in a three-part series last spring in which it was concluded by studying the organization’s very own words that they are incontrovertibly opposed to the legitimate Damascus government and want to form their own de-facto independent entity within Syria’s borders. Not only would this fracture the frail unity that still holds the country together, but Turkey declared that it wouldn’t tolerate such a terrorist polity along its southern borders and would militarily intervene to topple it, as can be seen by the presently ongoing operation. Pertaining to the SSNP, this organization is an openly revanchist one which seeks to right historic wrongs by reunifying Lebanon with Syria, though there is absolutely no way that this can ever happen in practice without Damascus ruinously adapting Beirut’s post-civil war system of “confessionalism” (politically institutionalized sectarianism), and even then, it’s likely that the many pro-Gulf Sunnis will still militantly reject this, to say nothing of ‘Israel’. The only way that the PYD and SSNP can responsibly partake in Syria’s forthcoming multiparty National Democracy is if they openly renounce the controversial platforms that were elaborated on above, which means that the Kurds must abandon their “federalization” (internal partition) and regime change plans, while the Nationalists must forget about reconstructing “Greater Syria” (and inevitably forcing Damascus to implement “confessionalism”) and focus instead on rebuilding the Syrian Arab Republic (and respecting its constitutional name) within its existing borders. Both of these expansionist parties must come to understand that their integrational goals do not have to follow outdated 20th-century templates and should adapt to the 21st century forms spearheaded by Russia and China, namely that peaceful multilaterally beneficial integration is achievable through the overlap of civilizational-historical links (i.e. Russia’s Eurasian Union) and connective infrastructure projects (China’s One Belt One Road/New Silk Road global vision).In practice, this means that both the PYD’s dreams of “Greater Kurdistan” and the SSNP’s ones of “Greater Syria” could be realized through joint Russian-Chinese multipolar connective infrastructure projects and the creation of regional economic-integrational associations between Syria, Lebanon, Turkey, Iraq, and even Iran. “Greater Kurdistan” and “Greater Syria” mustn’t be exclusionist projects that lead to a violent regional secessionist war or the potentially equally bloody liquidation of Lebanese statehood, respectively, but could be much better and peacefully advanced for all sides by retaining Syria’s internationally recognized and decades-established borders and strengthening the cosmopolitan civilizational core within this unitary state. Syria is on the verge of undergoing constitutional change per the requirements set out before it by UNSC 2254, and as the involved parties debate the best way to achieve this, they must all reach a consensus that the implementation of Russia’s federal-autonomy framework – or any such similar devolution model for that matter – needs to be strictly avoided at all costs. While Russia’s domestic administrative system is a legacy of Moscow’s historic territorial expansionism and helps to strengthen the state in the present day, such a model would only lead to the inevitable contraction of the Syrian state and its instantaneous weakening. The solution that must instead be pursued is for Syria to continue with President Assad’s decision to gradually transition the de-facto one-party state into a multiparty National Democracy, taking care to reject any pressure to blindly copy the West’s “liberal democracy” and instead independently take into account Syria’s unique civilization, history, culture, and circumstances when forming the new system. Due to the wartime situation and the post-conflict challenges that will doubtlessly plague the country for years to come, it might be necessary to implement certain temporary, indefinite, or permanent restrictions (possibly even codified into the UNSC 2254-mandated constitutional revision) on certain individuals and parties, such as people who committed war crimes or groups which openly harbor territorial aspirations (whether internally in the sense of “federalization” or externally such as building “Greater Syria”). There is no quicker way for Syria to cease to exist as a state than for it to be pushed into a regional state-on-state conflict during this highly vulnerable time due to the demagogic-ideological aspirations of fringe parties that are obsessed with forging “Greater Kurdistan” and “Greater Syria” whatever the cost may be. Therefore, it would be to the overall benefit of national stability if the new constitution stipulated that the Damascus central government of the Syrian Arab Republic has the final say over who and which organizations can participate in the elections (whether such a clause is temporary, indefinite, or permanent) in order to prevent a chaotic free-for-all among dozens of competing and ideologically contradictory groups. If Syria is to survive, recover, and prosper once more, then the number one requirement for it to follow is that it absolutely must remain a unitary state under any circumstances, albeit one which continues with its political evolution towards a multiparty National Democracy according to its own unique criteria and circumstances. Political, ethnic, and religiously extreme groups (SSNP, PYD, and Salafist organizations) must either renounce their destabilizing ideologies as a precondition for participating in the forthcoming national elections or face the consequences of potentially being barred from the race. Syria simply cannot afford to entertain any organizations which aspire to deliberately or inadvertently push the country closer towards international and/or civil war during this historically vulnerable time, since the secular Arab Republic will never be rebuilt if it perpetually teeters on the edge of a Hobbesian civil conflict between the revanchists, separatists, and Islamists that constitute the political opposition. Syria only has a future if its multiparty National Democracy is composed of unitary, secular, and domestically focused patriotic groups, which is why it’s so important for the authorities to urgently encourage all relevant internal stakeholders to take concerted steps in synchronizing their positions on these uncompromising principles in the interest of protecting the common long-term good of all Syrians.